Md. 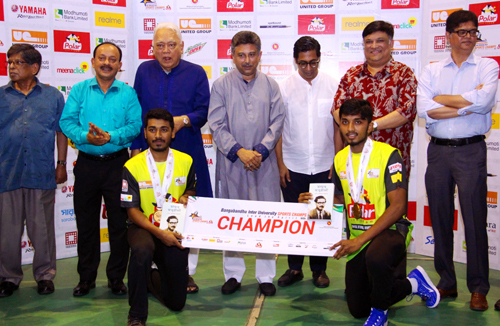 Mukter Hossain and Al Amin Zuman of Daffodil International University- Championship winner in Badminton Man's Doubles final of Bangabondhu Inter University Sports Champ 2019 pose for a photograph with Mr. Noor-E-Alam Chowdhury, MP and Mr. Nahim Razzaque, MP, along with Mr. Monjur E Elahi, Chairman, Board of Trustees, East West University and other distinguished guests. Daffodil International University won the Double Crown of Man’s Badminton in Bangabondhu Inter University Sports Champ 2019. Daffodil International University became champion In Man's Singles and Doubles and Runner Up in Mixed in ‘Bangabondhu Inter University Sports Champ 2019’ held on 12 April 2019 at East West University. In the final round of Man's Singles, Al Amin Zumar, a student of the department of Environmental science & Disaster Management of Daffodil International University faced to Joshor University of Science & Technology and won 2-1 set and won Gold Medal. On the other hand, Md. Mukter Hossain of BBA Department paired with Al Amin Zuman of Environmental Science & Disaster Management department of Daffodil International University defeated Sylhet Metropolitan University in Badminton Man's Doubles final in 2- 1 set and clinched the title. Beside this, Arpa Chakma of Tourism and Hospitality Management Department paired with Al Amin Zuman of Environmental science & Disaster Management department of Daffodil International University was defeated to Joshor University of Science & Technology by 2-0 set and became Runner Up in Mixed category. 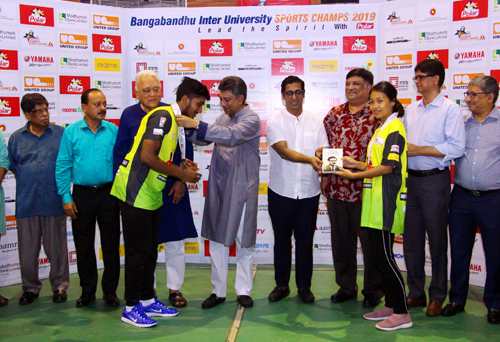 Daffodil International University is the only university which got championship in two category and runner up in one category in Badminton in ‘Bangabondhu Inter University Sports Champ 2019’. Arpa Chakma of Tourism and Hospitality Management Department paired with Al Amin Zuman of Environmental science & Disaster Management department of Daffodil International University receiving Runner Up Medal from Chaief guest. Mr. Noor-E-Alam Chowdhury, MP was enjoyed the final matches and distributed medal among winners as the chief guest in medal giving ceremony. 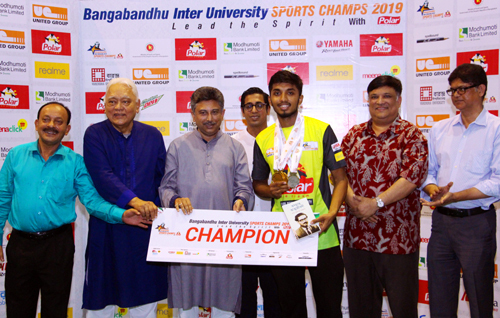 Mr. Nahim Razzaque, MP, Convener of Bangabandhu Inter University Sports Champs-2019, Mr. Monjur E Elahi, Chairman, Board of Trustees, East West University, Mr. Amir Hossain Bahar, General Secretary of Bangladesh Badminton Federation, Mr. Md. Shafiul Azam, Managing Director, Modhumoti Bank Ltd. Mr. Nowroz zoha, Regional Sales Manager, Polar Ice cream were present at the program as the special guest. It mentioned that ‘Bangabandhu Inter-University Sports Champ 2019’- organized by the Ministry of Youth and Sports of the Government of People’s Republic of Bangladesh and sponsored by Polar Ice-cream. Almost 65 universities were participated in this sports competition.